Remove and take them into a bowl. And let them cool. To the same oil add ginger garlic paste. 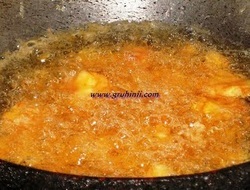 Fry until raw smell of the ginger garlic paste is gone and starts leaving oil. Switch off the flame and let it cool. 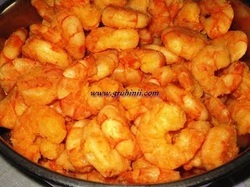 Now to it add the fried prawns, red chilli powder, lemon juice and the remaining salt. Mix well and store it in a air tight container. Prawns pickle/Andhra Royyala pachadi is ready........... Leave the pickle in the room Temperature for a day and refrigerate it........ Tastes good for more than a month if refrigerated. 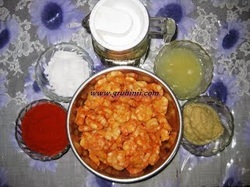 This is an Andhra Style of preparing Prawns pickle which is mostly made in Guntur and Ongole Districts of Andhra Pradesh.